Another day, another gig. This time it was for Eddie Izzard. 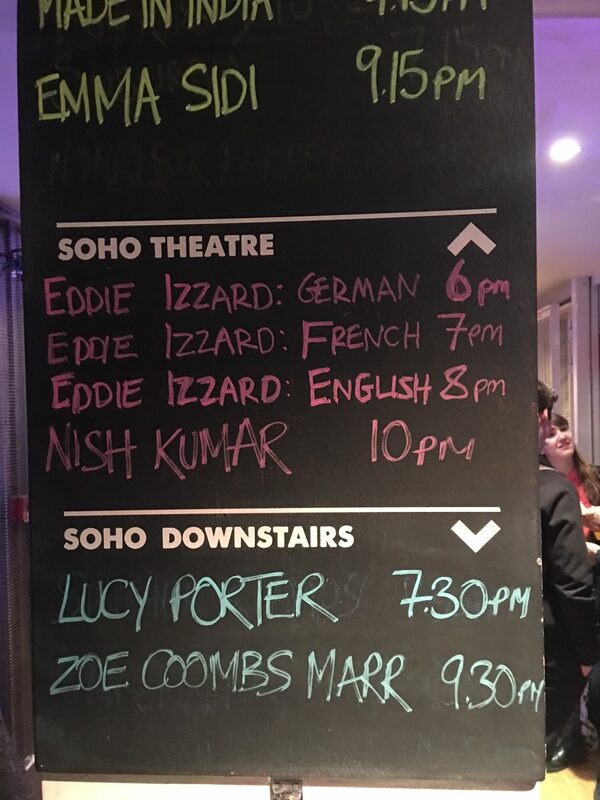 A month or so ago I got a tweet from Soho Theatre saying the was doing a triple header of his Force Majeure show. I’ve not been at the Soho Theatre since seeing Pete Firman (the magician) last year. One I thing I noticed for Pete’s show is that they now do allocated seating at the venue’s theatre room. This is great news as you no longer have the mental queuing starting 15 minutes before the doors open as your tickets have your seat number. The reason for the triple bill was he was going to perform the show in French, German and English. When I booked the tickets I checked over and over again to make sure I got tickets for the correct show. The tickets I purchased were at the end of a row and when we arrived at our seats there was someone already in them. The conversation went like this. (he pointed to two seats in the middle of the row in front). The guy reluctantly left our seats and moved to his seat. I go for end seats as you aren’t as squeezed and I can stretch my legs out in the aisle. Does that make me an arse for not moving? Its not my fault he couldn’t buy seats together. Anyway…this has little to do with Eddie’s show. There was no fan-fare for Eddie to come out to, the lights dimmed and he walked out from behind the curtain. There was a rapturous applause immediately and the show started. I remember seeing Eddie Izzard’s first video show and finding him hilarious. By the 3rd one I found his surrealism not to my taste. I still laughed but not as much as the first show. Unfortunately this show felt more like the 3rd show than the 1st. He had already performed the show twice that evening, in two other languages, and that might have affected the energy her performed with. Some of his ad-libs didn’t hit the spot and occasionally his surrealism lost steam – “I’m a transvestite…..in a ……..skip.” – it felt like he didn’t have the confidence in the ending of the sentence. I did have a proper chuckle at the death of Caeser, mainly due to the word play with the other characters in the scene. I also enjoyed the act-out of Martin Luther hammering his 95 theses to the church door. This was performed in German and the whole audience understood everything that was happening even if, like me, they didn’t consider German to be a language they spoke. The show started talking about human sacrifice and ended talking about olympic dressage and dressage horse burglars. Very ‘out there’ as a concept but there was much laughing through-out the theatre. The show ended and Eddie added a few words afterwards about staying engaged in politics and not giving up the good fight against those who want see the UK as a protective Island that doesn’t welcome people. As we left we both were happy to have attended. We enjoyed enough of the show but would not have been happy to have seen something like this in a larger venue (with the larger costs!). 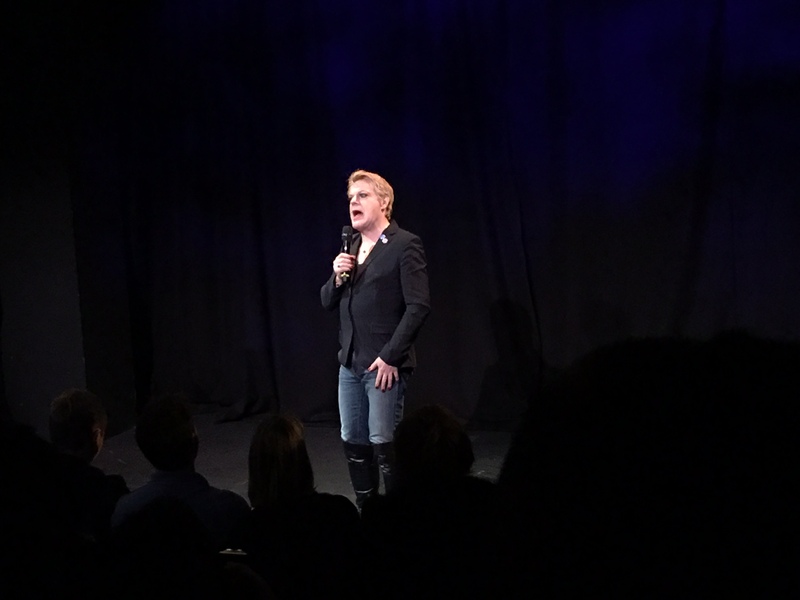 I’m happy to have ticked off seeing Eddie Izzard from my list of comedy people to see. When we got home I shared a clip of Eddie’s Cat/Drilling behind sofa and then his DeathStar Canteen scene. These made me laugh LOADS and reminds me that he definitely has written some excellent stuff. 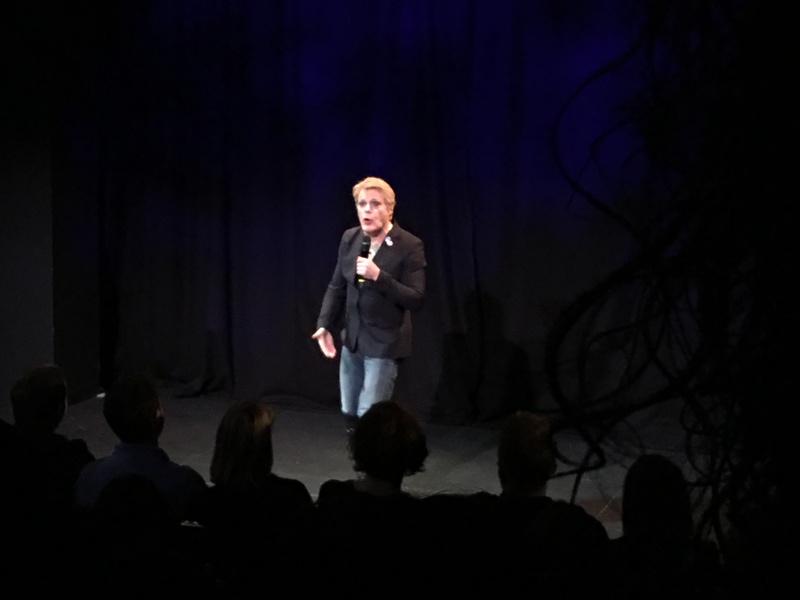 I probably wouldn’t watch him again although if he does any warm-ups for a new show at a venue like Soho Theatre then I might buy a tickets, just as long as he hasn’t already done 2 other hour long shows immediately beforehand!